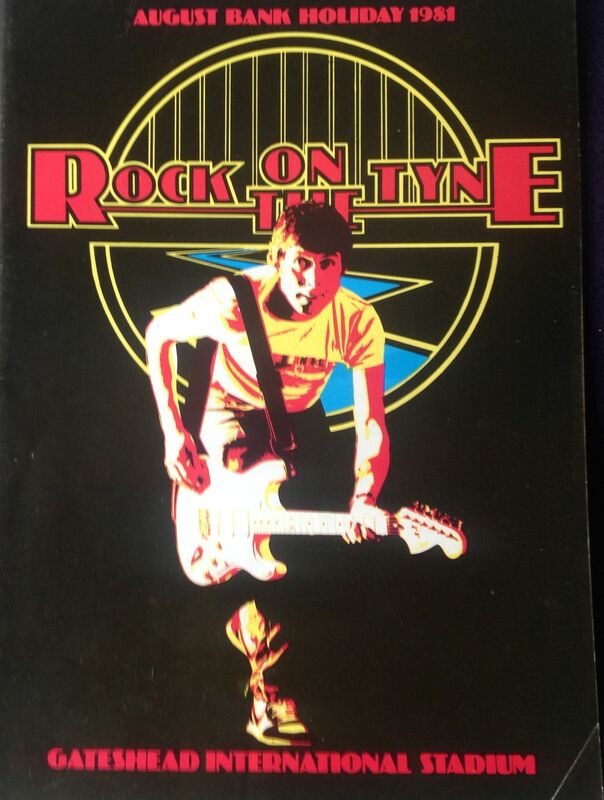 In 1981 the north east for its own rock festival in the shape of Rock on the Tyne, a two day event which took place at Gateshead Stadium over the August bank holiday weekend. So we decided to forego our usual annual trek to Reading and sample the delights of this new event. That seemed a big choice, and a bit of a dilemma for me at the time, as I had been going to Reading for 9 consecutive years. As it happened, having made the break from going to Reading I never returned, which in hindsight was a mistake…. The line-up for Rock on the Tyne was (according to my tickets) as below. Sunday. 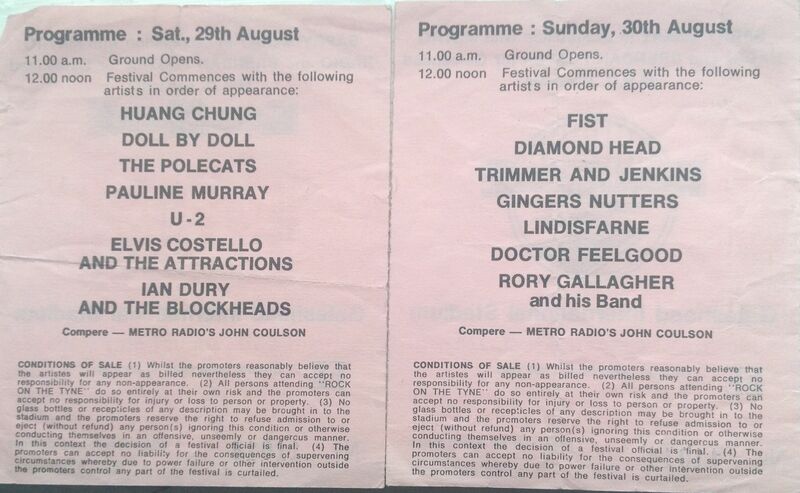 Fist, Diamond Head, Trimmer & Jenkins, Dr Feelgood, Ginger Baker’s Nutters, Lindisfarne, Rory Gallagher. One of my main reasons for attending was to see up and coming new wave Irish band U2; this was their first appearance in the north east. I remember getting to the festival just in time to see their set late on Saturday afternoon. U2 were amazing at this point in their career. Bono was passionate, full of energy and you could just feel how hungry he and the rest of the band were for the massive success which was soon to follow. Stand-out songs were 11 O’Clock Tick Tock; I Will Follow (which they performed twice, once during the main set and again as part of the encore) and Fire. I remember Bono climbing up the lighting rig during (I think) Fire. Or perhaps that was the following year when they supported the Police at the same venue, or maybe it was on both occasions (actually I think it was both times ?) The memories are fading now, but what I do remember is that U2 were the highlight of the festival, and they were the band that everyone was talking about. Ian Dury was good, Elvis was moving into his country period, Ginger Baker had a massive drum kit (of course). 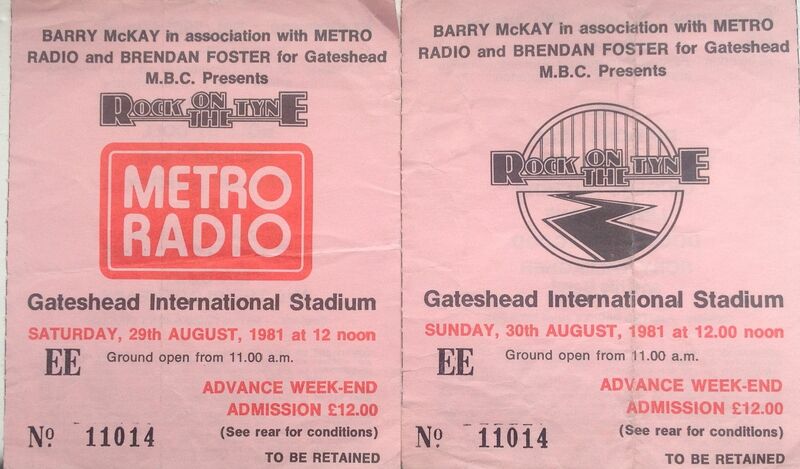 The festival wasn’t that well attended and wasn’t repeated although Gateshead Stadium has been used for concerts since then, including the aforementioned Police and U2 gig which took place the following year. U2 setlist: With A Shout; 11 O’Clock Tick Tock; I Will Follow; An Cat Dubh; Into The Heart; Another Time, Another Place; The Cry; The Electric Co.; I Threw A Brick Through A Window; Stories For Boys; Out Of Control. Encores: I Will Follow; Fire. This post takes me up to the letter “U”. I will continue with “U” tomorrow, by writing about U2 in concert.